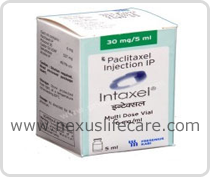 Uses:- Paclitaxel Injection is used to treat various types of cancer. It is a cancer chemotherapy drug that works by slowing or stopping cancer cell growth. Side Effects:- Bone marrow depression, hypersensitivity reactions, myalgia, chest pain, bradycardia, a stocking-glove sensory neuropathy, mucositis, nausea, vomiting, diarrhoea, alopecia Tachycardia, rash, hypotension, arthralgia.